I stopped dead in my tracks (well, quivering finger hovered over the mouse is more like it, I guess) when I saw this. Come to mama. Find this bacon pizza recipe here and add it to your menu tomorrow! I think it looks divine. Oh yum, this looks divine! We are hiding out at our beach house right now hoping Arthur makes a fast visit. Rain or shine I have delicious red, white and blue daiquiris. Yummmm!!! Who wants flag cake when you can have flag pizza?! Oh my! This looks positively amazing!!!! I'm with Kristen! 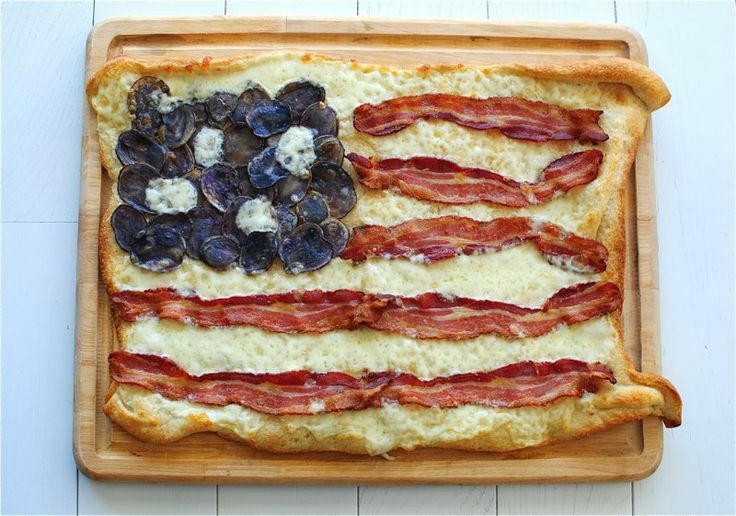 I'll take flag pizza any day and that one looks so yummy! Happy 4th darling! xoxox! We are sitting in a house at Ocean Isle Beach listening to a great thunderstorm! My family will be joining us by lunch tomorrow, We are making homemade pizza Saturday…..this recipe looks great! OMG. How have I never seen or thought of this before?!?!?! Genius. Wish I had bacon right now and could make this tomorrow!